In this game, we have the leading commanders with the Noble trait. But above all others stands the King. But as the King of Gondor took a holiday to Minas Morgul that he came to regret, we are left with the line of Stewards. This is reflected in the game through the Steward trait, which is held in high regard in the community. This single trait has broken the game time and time again, and continues to do so to this day. As mentioned before, the house of Stewards watches over the throne until the king returns. However, while the steward of Gondor might actually have a purpose and some power, the Stewards of Orthanc certainly do not. This can be seen through their lack of a Steward trait, making them less powerful than the Steward of Gondor. The concept of Stewards is not unfamiliar to the side of evil either, as there can also be Trolls with that name, though the spelling can be different. Apparently all Stewards have a rational fear of something, they named an entire AP after it! Not sure what it is though, maybe the dark, maybe steward-eating tomatoes? 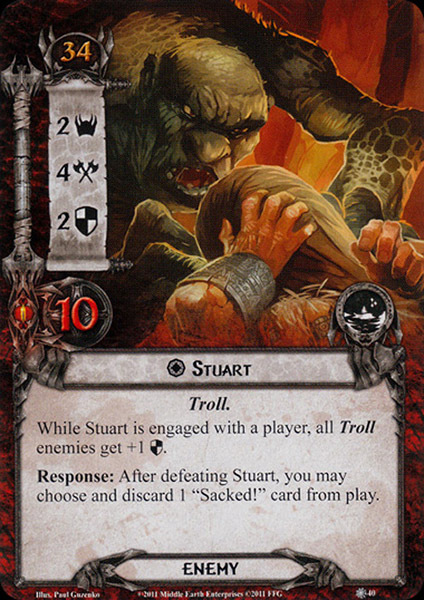 Stuart the Troll plays well with other Troll cards. This is a good thing because there tend to be a couple in play during Conflict at the Carrock from what I have heard. There were no physical staples found in any of the cards, trust me, I checked. They are only made from cardboard. Have you even heard of Denethor? He denied the Return of the King! Plus he has no table manners. 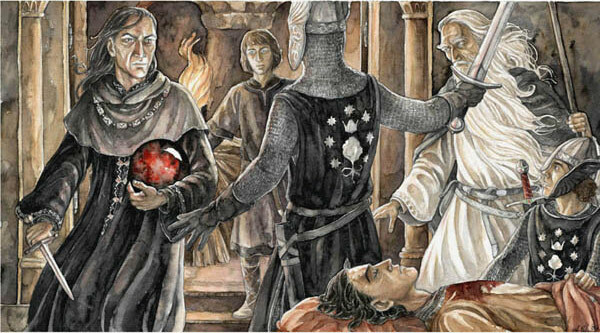 There is only one true Steward of Gondor. And he does not share deckspaces! I would like to thank you for the well-researched article, highlighting a major trait that had been neglected so far. Come on, RingsDB contributors: where are those Steward-themed decks us netdeckers have been dreaming of?